Unleash your ideas with a system that will evolve with your company! Custom solutions for your next venture can be modeled and deployed using existing systems in place. 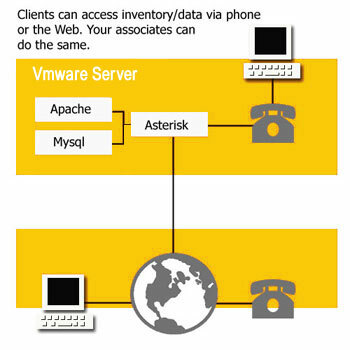 This example illustrates the merging of online Web based database of products or information with a VOIP system, providing access via a standard telephone. Flexibility is built into mimicIT's core ideal. It's our job to make sure your ideas for the future can be met as well as your expectations of our technology. We want to be your bridge all the things that Information Technology can offer, we want to help take your company forward into the future. If you're ready to take your concept to the real world, we can help. mimicIT will work for you in any situation. Learn the importance of Presence.